Manila, Philippines – the Supreme Court has ordered three of its officials to explain their involvement in the procurement of a luxury car by then chief justice Maria Lourdes Sereno. 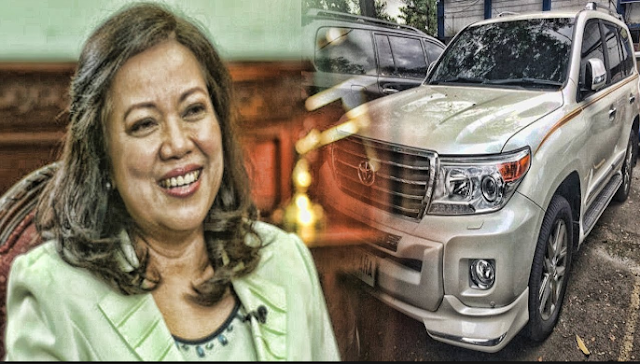 The Commission on Audit (CoA) revealed that there is an irregularity on the acquisition of the Toyota Land Cruiser as Sereno’s service vehicle. The state auditor has issued an Audit Observation Memorandum (AOM) dated June 1, 2018 addressed to Acting Chief Justice Antonio Carpio. Carpio, on June 13, instructed the following SC officials to give their explanation about the memorandum; Ma. Carina Cunanan, assistant chief of office of Administrative Services and chairman of the Procurement Planning Committee; Thelma Bahia, former SC deputy administrator and former chairman of the Bids and Awards Committee; and Corazon Ferrer-Flores, Deputy Clerk of Court and chief of the Finance Management and Budget Office. According to CoA, there was no bidding conducted for the procurement of the service utility vehicle of Sereno, and the documents that proves purchase were submitted late. Sereno’s vehicle was bought for P5,110,500.00. Further, CoA reported that the acquisition of the special Toyota Land Cruiser violated Republic Act 9184 and its Internal Rules and Regulations, as it was only Toyota Makati joined a public bidding to procure the said vehicle. Sackur: (interrupting) Well this is highly detailed and you are saying this has never been tested in an impeachment trial in the senate. But what ...but I do want to ask you before we move off the detail to broader points is this... extravagant and lavish lifestyle that the government has accused you of conducting, including the purchase of a special Toyota Land Cruiser 'cause you didn't like the official car that you were provided with 'cause it wasn't grand enough, and your ... your tendency to enjoy business travel and lavish hotels... are you telling me there is no truth to any of this at all? Sackur: (interrupting) You don't have a Toyota Land Cruiser when you were Chief Justice? Sereno: Ok, Stephen. Stephen. Yeah. Stephen the rules say that whatever security vehicle the President is entitled to, I am entitled to. It got full court approval so that's the end of it. Now with respect to lavish hotels, the only hotel that they could say that was a five star hotel was a hotel room that was used for the signing of the ASEAN accord by ten chief justices. So it was already used as a function room. At night nobody slept in it so I slept in it. So that doesn't amount to much, Stephen. We got it at a very big, huge block discount And the third with respect to business travel. Of course, business travel is de rigeur for someone entitled to the same accommodations. Because my... my position is already considered as one of the five highest offices in the country.